Some time ago, Judith Williams, a long time supporter, made a very generous donation to the Friendship Office, with the intention that it be used to build a school. Jutith’s parents were both teachers, and she wanted the funds to be used to build a school in their honor. Because of such widespread need, it took the Friendship Office some time to locate the ideal community. But once the first meeting with the Mayor of El Sauce happened, she convinced us that Jiquelite was the community that should get a new school. 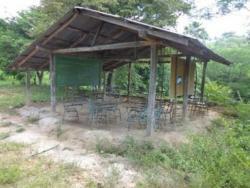 Once we knew of the rustic conditions in the community, we wer more convinced than ever! 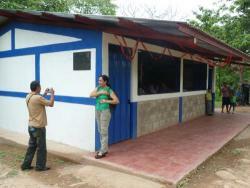 In June, Friendship Office staff attended the inauguration of the new school in the village of Jiquelite. It is truly a dream come true for this remote community. It was possible thanks to the generosity and bonds of friendship between our peoples. At the inauguration many people from the community shared about their gratitude for this generous gesture of solidarity with the people of Nicaragua. · Judith Williams whose dream was to build school for children in Nicaragua in honor of her parents, Lew and Betty Williams. · Arnie Matlin and Magda Lanuza who helped to add a kitchen onto the school grounds for a school lunch program. · Rita Clarke whose vision made this possible. In July, we shared photos and news of the inauguration with Rita Clarke at her home in Virginia. For years, Rita’s vision of building friendships between the people of Nicaragua and the United States has resulted in schools, wells, health services in poor communities as well as dedicated work to forge policies of peace and justice. Her spirit and vision continue in Jiquelite.